Director Denis Villeneuve‘s Arrival continues a surprising streak of successful hard science fiction films from Hollywood. Based on the Nebula award – winning novella “Story of Your Life”, the script by Eric Heisserer takes a linguistical view of first contact with an alien race. The approach is about as far from something like Independence Day as one can get. However, Villeneuve and crew take the high road so consistently that a naturally dramatic situation sometimes feels a bit bloodless, at least until they cut loose with an admittedly emotional finale. Linguistics professor Louise Banks (Amy Adams) is recruited by U.S. Army Colonel Weber (Forest Whitaker) to join a science team attempting to communicate with one of twelve alien spacecraft that have descended on points around the globe. 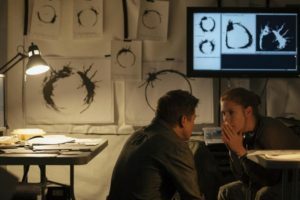 While much of the rest of the team, including physicist Ian Donnelly (Jeremy Renner), is stumped or even repulsed by the sheer alienness of the visitors, Banks begins to make progress on their written language, realizing that its structure may reveal something about how they think. Amy Adams is great as usual, believable as both the scientist explaining theory to the conveniently clueless Colonel Weber and as a human facing the truly alien. The strength of her work helps the film paper over some difficulty with what seems like magical abilities acquired by learning the aliens’ language (or, insert adage about advanced technology vs magic here). Renner is also likable as the quick-witted physicist, helping to lighten things up a bit. Unfortunately, the story does give up much of its hard-earned credibility with a late plot twist involving a phone call that a friend quite accurately described as straight out of Bill & Ted’s Excellent Adventure. All this being said, more of Arrival works than does not. The design of the aliens and their spacecraft is perhaps a bit understated (although both are oddly, and intriguingly, Lovecraftian), but Villeneuve’s restraint does manage to restore some class to alien invasions. One might wish for a few more fireworks as the pressure mounts to figure out the aliens’ motivation, especially with a panic-stricken global populace kept mostly on the back burner. Ultimately, though, the film stays commendably committed both to its exploration of linguistics, and the emotional story at its core. Villeneuve appears comfortable in, and in control of, the genre, perhaps a taste of things to come from his much-hyped next project, Blade Runner 2049.